An outstandingly well planned tour, clearly based on your detailed experience and excellent local agents in each country. Feel lucky to have been to Tibet, I can't praise it enough. We found Bhutan and Tibet interesting and worthwhile with lots of good walking and sightseeing. Our extension to Chitwan was extremely memorable due to the staff, guides and accommodation, the whole of the planned programmes ran to time. We met interesting people in the villages. The guides in Bhutan and Tibet were first class. This exciting trip to Nepal, Bhutan and Tibet offers an amazing journey through three spectacular Himalayan countries. Although geographically close to each other and enjoying many historic and ethnic links, these countries are in fact each scenically and culturally very distinct and a trip to all three offers a fantastically varied trip. You will have plenty of time for sightseeing and for some optional walks as well as enjoying some of key cultural highlights of each country. Firstly, arriving in Kathmandu you will have your first sight of the Himalaya, travelling out of Kathmandu to Dhulikhel for spectacular dawn views of the mountains including Everest itself, with an incredible panorama from Everest to Annapurna. You will also have time to explore Kathmandu city and to see some of the wonderful Newari architecture of the towns and villages of the Kathmandu valley. Then it’s on to Bhutan. On the flight to Paro you will fly alongside the Himalayas with possible views of Mount Everest away to the left and of Bhutan’s mountains as you land. On arrival in Paro you will immediately be struck by the contrast to Nepal - national dress is still widely worn by both men and women in Bhutan with even officials at the airport wearing this distinctive apparel. Bhutan was never colonized and the Bhutanese are very proud of their own unique Buddhist culture and social traditions, and of their own distinctive building style, seen in the magnificent fortified dzongs, temples and monasteries as well as in its unique attractive farmhouses. On your visit to Bhutan you will see some of the finest buildings in the country, including impressive Taktsang Monastery (the famous ‘Tiger’s Nest’) in the Paro valley and the magnificent riverside dzong at Punakha. Returning briefly to Kathmandu you then fly on to Lhasa. On the flight to Lhasa you actually pass between two of the highest mountains in the world, Mount Everest and Mount Kanchenjunga, before landing in Tibet. Here on the high Tibetan plateau, the air is thin and the scenery is rather stark but very dramatic and is quite different to either Nepal or Bhutan. You will visit some of Tibet’s most important historical, religious and cultural sites. Firstly you travel east to Tsedang and the ‘Valley of the Kings’, considered to be the cradle of Tibetan civilization and Tibetan Buddhism. You will also travel to one of the most important locations for Tibetan Buddhism at the monastery of Samye before you continue to Lhasa where your first sight of the spectacular Potala will be breathtaking. As well as sightseeing in Lhasa you will have time to join pilgrims on a ‘kora’ around the famous Potala Palace and for a visit to the historic Barkhor market. The September departure of this trip attends the Thimphu Tsechu, one of Bhutan’s most important and impressive festivals. September departure attends the Thimphu Tsechu. Meal arrangements: Bed and breakfast in Kathmandu, all meals elsewhere. Fly from Kathmandu to Gonggar/Lhasa. Drive to Tsedang. Sightseeing to Samye and in Yarlung Valley and drive to Lhasa. Sightseeing in Lhasa. Drive to Gonggar and fly to Kathmandu. Attend Thimphu Tsechu. Visit Wangditse Monastery. Sightseeing in Thimphu and drive to Punakha. Punakha sightseeing and and drive back to Paro. Visit Taktsang and Paro valley sightseeing. Drive to Chele La for views. On arrival in Kathmandu you will be met and looked after by our partners there. Then once you arrive in Tibet, you will have an English-speaking Tibetan guide and driver/s. Guides are certified/registered guides, and in their company you will certainly gain an insight into the way of life, traditions and culture of the country you are visiting. Day 1 - Fly London to Kathmandu. Depart the UK to fly to Kathmandu. Day 2 - Arrive Kathmandu. Transfer to hotel. On arrival in Kathmandu you will be met and transferred to the Hotel Shangri La. This is a very comfortable hotel situated to the north of Thamel, the tourist district of Kathmandu. It has a lovely garden with a swimming pool and several excellent restaurants. The bustle of Thamel, with all its restaurants, shops and bars, is a 20 minute walk or 10 minute taxi ride away. You could eat in the hotel or head off into Thamel to one of the famous restaurants there, such as Rum Doodle Restaurant, a place frequented by trekkers and climbers alike, with pride of place given to a board with the signatures of many Everest summiteers. (Your Tibet permit will be finalised while you are in Kathmandu, so our local agents will ask you for your passport and payment). Day 3 - Morning sightseeing tour of Kathmandu. Drive to Dhulikhel in the Kathmandu Valley. In the morning you will have a guided sightseeing tour of some of the key cultural sights of Kathmandu. Firstly you will go to Swayambhunath, the so called 'Monkey Temple' because of the large numbers of monkeys that live there. This temple is said to be the divine lotus flower floating above the lake that once covered the Kathmandu Valley. This is the most famous image of Nepal - the all seeing stupa with eyes surveying every corner of the valley. You will then continue to Kathmandu Durbar Square, the ancient medieval centre of the city, now a UNESCO World Heritage Site. Here you will see host of wonderful temples and palaces, including the temple of the Kumari, the so called 'living goddess'. You will then continue to Boudhanath with its huge stupa, a centre for Tibetan Buddhist culture. Pilgrims from all over Nepal, Tibet and India walk clockwise around this stupa, turning prayer wheels and chanting prayers. In the afternoon you drive to Dhulikhel, a small town located about an hour and a half's drive from Kathmandu on the eastern rim of the Kathmandu Valley, along the main highway leading to Tibet. Dhulikel is famous for its panoramic views of the Himalaya. On arrival you should have time for a visit to town and then to enjoy fine sunset views in the evening. Day 4 - In Dhulikhel. The mountain views from Dhulikhel are some of the finest in the Himalaya, with dawn being especially spectacular - on a clear day from here you can see from Everest in the east to the Annapurna range in the west, as many as twenty major Himalayan peaks. It is worth arranging an early morning wake-up call to be sure of catching the views at their best. Later you have the day free to relax and enjoy the beautiful countryside around Dhulikhel. You could perhaps take a walk to a nearby village such as Panauti, with its traditional farmhouses set on hillocks among the rice fields, or visit Namobuddha Monastery, a sacred spot where commemorates the legend of the Buddha's selfless action of offering his own flesh to feed a starving tiger. In these surroundings you can immerse yourself in the simple pleasures of traditional rural life in Nepal. Day 5 - Return to Kathmandu with sightseeing in Bhaktapur on the way. Afternoon at leisure. Today you will drive back to Kathmandu, visiting the ancient city of Bhaktapur on the way. Bhaktaphur is one of the three cities built in the Kathmandu valley by the former Malla kings. It is more laid back than Kathmandu city and still has quite a rural feel to it, being a town of farmers and craftsmen. The Durbar Square area has some beautiful examples of magnificent Newari craftsmanship in its temples and palaces, especially the famous Palace of Fifty Five Windows which in its elaborately carved windows and doors features some of the finest examples of Newari wood carving. Bhaktapur's side streets have a wonderfully medieval feel to them. Most of its buildings have their origins in the 15th Century and the back streets are brick paved. The city is still very much a lived-in, with much of it being closed to traffic - this makes walking around it a real pleasure and you can get a real taste of how things must have been in medieval times. When you get back to Kathmandu you will have the afternoon free and you can either relax at the hotel or do some more sightseeing. The ancient Buddhist Stupa of Boudhanath is well worth a visit - it is a focus of Buddhist culture and is visited by pilgrims from all over the region. You might also visit the Shiva temple and cremation ghats on the banks of the Bagmati River at Pashupatinath. Day 6 - Fly to Lhasa, Tibet. Drive to Tsedang, 3,550m /11,647ft - 2-3 hours. Transfer to the airport for the flight to Gonggar in Tibet. This is an exciting flight which goes east along the Himalaya, passes Everest (on the left hand side of the plane) and then cuts through the chain to continue north east towards Lhasa. 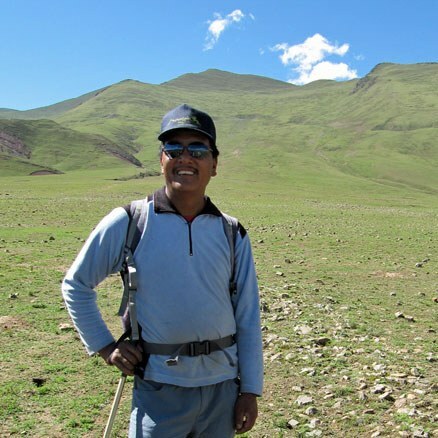 At Gonggar (the airport for Lhasa) you will meet your Tibetan guide and your driver. You then drive east alongside the mighty Tsangpo River (called the Brahmaputra when it reaches India) to Tsedang at 3,550m/11,647ft. Tsedang, the capital of Shannan prefecture and the second largest city in Tibet after Lhasa, has some Tibetan buildings but as in so much of Tibet, Chinese influence is now predominant. But Tsedang does have an important place in the history of Tibet. It was here, on the nearby hill called Gongpo Ri that, according to legend, the Tibetan race originated, from the union of a monkey and an ogress. Tsetang was said to have been their playground. There might be time this afternoon for a little exploration - Tsedang has a Tibetan quarter with traditional houses and several monasteries of interest - but it is probably best to rest and take it easy to help acclimatise to the altitude. In the main street outside the Tsedang hotel there are lots of restaurants serving good food - so in the evening you might try locally caught fish served with lots of chillies, or a Chinese hotpot. Day 7 - Visit Samye and sights in the Yarlung Valley. Today you will have a full day around Tsedang. Firstly you will visit Samye Monastery. The drive by the newly built road to Samye now takes one hour. Until recently this important monastery could only be reached by taking a ferry across the Tsangpo River. This was an exciting boat ride but with the building of the road the ferry now only runs sporadically if at all. Samye was founded 1200 years ago and was the first monastery with monks in Tibet. It was the royal temple up to the end of the Yarlung Dynasty and is built in the shape of a Mandala. It is most closely associated with the Nyingmapa order of Buddhism, which is one of the oldest orders of Tibetan Buddhism and dates back to Padmasambhava, an Indian Buddhist master who is credited with bringing monasticism to Tibet in the eighth century. After your visit inside the monastery you might like to climb nearby Hepori Hill, considered one of the four sacred mountains of Tibet, for fantastic views over Samye. From the summit there are also wonderful views out across the Tsangpo Valley. After the visit to Samye you return to Tsedang. The area around Tsedang is considered to be the cradle of Tibetan civilisation. In the nearby Yarlung valley, a short half-hour drive from Tsedang, is the fortress/chapel of Yumbulakhang, a distinctive tapering structure perched on a crag, said to be the oldest building in Tibet and to have been built for the legendary King Nyentri Tsenpo. Its origins may date back more than 2,000 years. If you climb the ridge above Yumbulakhang you will get good views of the Yumbulakhang and the Yarlung Valley and the mountains to the south. The first cultivation in Tibet is thought to have started in this valley. It was also from Yarlung that early Tibetan kings unified Tibet in the 7th century. In nearby Chongye are found the burial mounds of these earliest kings. One of the larger mounds, topped by a monastery, is that of King Songsten Gampo who was the first royal patron of Buddhism in Tibet and in whose reign building of the Jokhang Temple was started. Tandruck Monastery, also situated near Tsedang, is one of the earliest Buddhist monasteries in Tibet, dating to about the same time as the Jokhang in Lhasa and you should have time to visit it on the way to Yarlung. Day 8 - Drive to Lhasa, 3,658m/12,001ft. Visit Jokhang Temple and Barkhor Market. After breakfast you will drive to Lhasa with visits to a couple of places on the way. Firstly you drive a short way off the main road to see the old manor house at Namseling. Built in the 14th century this large and ancient building was an aristocratic manor house and is one of the very few remaining non-religious buildings to be found in Tibet. Sadly it was allowed to fall into a state of some disrepair but there has been some restoration work and hopefully this wonderful old building is now saved from dereliction. Until the mid 20th century the house was the centre of a grand estate and was surrounded by farm buildings and thriving orchards and gardens. Some people in the village still remember the old days when the estate was fully functioning. Later, also within living memory, in the 1960's, the building was used as a school. There are lovely views from Namseling over the Tsangpo valley and towards Hepori Hill, which marks the area where Samye monastery is situated. Continuing towards Lhasa it is also worth taking a detour to visit the famous monastery of Mindroling, one of the few monasteries in Tibet belonging to the Nyingmapa sect (this is the sect to which the Sherpas of Nepal belong). You then continue, past the airport, and drive through a tunnel through the mountains and continue to Lhasa alongside the Kyichu River. Lhasa looks a very modern Chinese city and as you drive in you will pass the new railway line coming in from China. But despite this apparent modernity your first view of the Potala Palace will still take your breath away. Your hotel is in the Tibetan section of Lhasa and within walking distance of the Jokhang Temple and Barkhor market. After lunch you will visit the Jokhang Temple. This is the most sacred temple in Tibet and the centre of the Tibetan city. Pilgrims from all over Tibet flock to visit it. You will see them circling the Barkhor turning their prayer wheels or making full-length prostrations around the temple. To visit the Jokhang you will join these pilgrims as they shuffle round inside, making their offerings and feeding the thousands of flickering butter lamps. The temple was initially established in the 7th century by King Songtsen Gampo. It takes its name from the sacred image of the Buddha, the Jowo Shakyamuni, the most highly revered image in Tibet, a statue which was brought to Tibet by Songtsen Gampo's Chinese wife and which is now housed in one of the chapels of the Jokhang. The Jokhang itself was however originally designed by Nepalese craftsmen brought to Tibet by Songtsen Gampo's second wife who was from Nepal. Since that time the temple was further enlarged during the reign of the Fifth Dalai Lama. It is worth visiting the roof of the Jokhang for wonderful views of the city and surrounding hills. The Barkhor market is the area surrounding the Jokhang and is full of vendors selling all manner of wares; stirrups for dashing nomad horseman, tacky souvenirs for Chinese tourists and all sorts of other ephemera. Shops in the nearby streets display huge slabs of butter which pilgrims purchase to feed the butter lamps in the Jokhang temple. The characteristic rather cheesy smell of such temples is from these butter lamps. Part of the Barkhor market is now housed in a nearby building. Day 9 - Sightseeing in Lhasa including the Potala Palace and Sera Monastery. Today you have a full day sightseeing in Lhasa. This will include the Potala Palace and the Norbulingkha, the former summer palace of the Dalai Lama. In the afternoon you will visit the Monastery of Sera. In the morning you will visit the Potala Palace. Luckily the Potala remained largely undamaged throughout the years of the Cultural Revolution. Songtsen Gampo was the first Tibetan ruler to establish a palace on this outcrop, the 'Red Hill', but construction of the grand palace that we see today began in 1645 during the reign of the Fifth Dalai Lama. The palace is named after Mount Potala, a sacred mountain in South India, and served as the home of successive Dalai Lamas and their monastic staff. You will start your tour at the top of the building where the view from the roof is stunning. You then work your way down through successive storeys and through a maze of rooms - through the living quarters of the Dalai Lama and down through numerous highly decorated chapels and colourful assembly halls. Walls are decorated with intricate murals and hung with painted thangkas. One of the most awesome rooms in the Potala is the Chapel of the Dalai Lamas' Tombs, which contains the massive golden stupa of the Fifth Dalai Lama and smaller stupas containing the relics of other Dalai Lamas. When you have completed your tour you may like to make a kora (circuit) right around the building, along with many Tibetan pilgrims who will be making the same circuit. You might also have time to visit the Norbulingkha; The name means 'Jewel Park' although nowadays it is known as 'People's Park'. The Norbulingkha was formerly the summer palace and recreation gardens of the Dalai Lama and it was from here that the present Dalai Lama escaped in 1959. The nearby Tibet Museum is also well worth a visit. Pass rapidly through the galleries justifying the Chinese occupation and you will find that the galleries on Tibetan Buddhism and Tibetan arts and crafts along with objects of everyday life are well worth the visit. There are many outstanding pieces on display. In the afternoon you will drive 40 minutes to Sera Monastery, one of the three great Gelukpa monasteries near Lhasa. This monastery dates back to the 15th century and was formerly a monastic township housing over 5,000 monks. Although many of the outlying buildings have been destroyed the principal buildings were left relatively intact and nowadays the monastic population is again over 300 monks. Sera is particularly famous for its great monastic debates and monks can still be seen debating in the debating courtyard. More prosaic but equally fascinating are the large monastic kitchens where monks prepare industrial quantities of food in huge copper cauldrons. It is quite a sight to see Tibetan tea being blended with a mixer the size of a road drill! Day 10 - Drive to Gongar. Fly to Kathmandu. You will have a fairly early start for the hour's drive to Gonggar International Airport and the hour long flight to Kathmandu. The best views of Mount Everest are from the right hand side of the aircraft, although seating is allocated. However if you are on the left hand side you will get wonderful views of Mount Kangchenjunga. The flight to Kathmandu usually arrives by mid morning and you will hopefully be back in the Hotel Shangri La before lunch. This leaves the afternoon free for last minute shopping with time for a last meal in the evening to mark the end of your trip. Day 11 - Fly to Paro. Drive to Thimphu, 2,230m/7,612ft - 2 hours. Transfer to the airport for the short flight up to Paro in Bhutan. On a clear day the panoramic views of the Himalaya are sensational, including Everest, but particularly exciting is the approach through the Bhutanese foothills and the landing, including a few steep turns to land at the tiny airstrip in the Paro Valley. Although you are at the mercy of the Druk air computer, if possible try to sit on the left hand side of the plane for the most spectacular views. On arrival you will be met by your guide and driver. You will then make the drive to Thimphu. En route you can stop to visit Tachog Lakhang, a temple built in the 14th century. To reach it you have to walk across one of the ancient bridges built by the famous 'Iron Bridge' builder Thangthong Gyalpo. Thangtong Gyalpo was a great Buddhist master and also a pioneering civil engineer of the 15th century who is said to have built 58 iron chain suspension bridges around Tibet. He is often portrayed holding a section of iron chain in his right hand. This is just a short walk of about 15 minutes and the temple has a wonderful atmosphere of old Bhutan and is a lovely place to visit. Thimphu itself has an attractive valley location and is relatively small for a capital city but it has grown greatly in recent years. There are many places of interest to visit there and initially, before checking in at your hotel, you might drive up to the giant Buddha statue to enjoy the splendid views out over the town. Depending on your flight schedule there may also be time for a little sightseeing round town or an orientation walk downtown. Day 12 - Attend the Thimphu Tsechu in the morning. Visit Wangditse Monastery in the afternoon. This morning you will visit the Thimphu Tsechu. The Thimphu Tsechu is one of the most important festivals of the year in Bhutan and is massively impressive. It is held in the Tashicchodzong, Thimphu's main monastic and administrative building Such festivals are important cultural and religious events and are a chance for local people to attain merit as well as dressing up in their best clothes, socialising and generally having fun. The masked dances and other colourful ceremonies are thought to dispel the evil spirits that have accumulated over the last year. Beware the very naughty clowns (called atsaras) who spend their time teasing the crowd and the dancers! Archery is Bhutan's favourite national sport and contests will be held during the festival and you may have the opportunity to attend one. They are quite lively affairs with the opposing teams doing all they can to put each other off - watch out for stray arrows as drink will have been taken! After lunch you will drive up to Sangaygang next to the Bhutan First Broadcasting Service tower, located in the North West of Thimphu. It is only about a mile drive up to the tower so if you feel like you would like to burn a bit more energy you can always walk up instead. From the tower you will have great views over Thimphu Dzong and the Thimphu valley as you start your walk contouring the beautiful hills to visit Wangditse Ghoempa. This walk should take around 1.5 hours. You will have time to visit the Ghoempa before you walk down for another 30 minutes to reach Dechen Phodrang Monastery. This Monastery houses around 450 student monks enrolled in a 8 year course. The monastery is also home to some fantastic UNESCO monitored 12th century paintings. You will then meet your vehicle and be driven back to Thimphu. Day 13 - Sightseeing in Thimphu in the morning. Drive to Punakha and visit Chimi Lakhang in the afternoon. This morning you will be sightseeing in Thimphu. You could visit the huge, Tashichhodzong, part monastery, part government headquarters. You might also visit the late king's memorial chorten, the textile museum, the indigenous hospital specialising in herbal medicine and the school of painting. You can also visit a workshop to see handmade paper being made - there are nice things made here which make good souvenirs or presents. It's also interesting to visit the Post Office to see some of Bhutan's famous editions of colourful stamps or even to buy the nice t-shirts they sell there. The handicraft emporium is a good place to buy local handicrafts or traditional dress. After lunch you will drive to Punakha. Driving out of Thimphu you climb to cross the Dochu La Pass, 3,048m/10,000ft, a spot marked by 108 chortens. Here, weather permitting you may take in a magnificent mountain vista. On clear days there are fabulous views of the eastern Himalaya from here, but this is a beautiful spot even on misty days. You then drive down through varied forest into the lush Punakha Valley. Day 14 - Visit Khamsum Yuelley Namgyal Chorten. Optional Punakha Valley walk. Visit Dzong. Drive to Paro. After breakfast you will make a short drive up the valley of the Mo Chu River and then walk up a hill to visit Khamsum Yuelley Namgyal Chorten. This chorten, standing on a ridge and giving beautiful views of the Punakha valley, was consecrated in 1999 and is a fine example of modern Bhutanese craftsmen following ancient architectural and artistic traditions. To reach it is quite a steep climb of about 45 minutes or so but the gorgeous views make it well worthwhile. You then have a couple of choices. You may either descend back the way you came to your vehicle and drive to Punakha, or you may walk down the valley to Punkaha, a pleasant, easy walk of about 8kms/1½-2 hrs. To do this walk you leave the grounds of the chorten via a different gate and descend to join a contouring path which ultimately leads you to the small village of Yabesa and you then follow the Mo Chu downstream past Sonagasha, the King's Palace and on to Punakha Dzong. The fabulous Punakha Dzong is one of the most spectacular and important dzongs in the kingdom. It is situated in a stunning position at the confluence of two rivers. In 1994 there was a major flood in the town which caused a lot of damage to the dzong, but it has now been beautifully renovated and is a real showcase for Bhutanese craftsmanship and painting. You are normally allowed to visit the inside of the dzong, unless there are VIPs visiting. After your visit to Punakha Dzong you will drive back over the Dochu La, perhaps having lunch in the café at the pass, and continue on to Paro. Day 15 - Full day in the Paro Valley including walk to Taktsang Monastery. A short drive beyond Paro town takes you to the trail head for the walk up to the famous Tiger's Nest, Taktsang Monastery. The monastery is perched some 600m/2,000ft up on a cliff overlooking the valley and was said to be where the legendary Indian saint, Guru Padma Sambhava, flew from Tibet on the back of a tiger to defeat five demons, who were opposing the spread of Buddhism in Bhutan. It's a steep uphill walk through woods, of about 1½-2hrs, to reach a tea house (an ascent of 340m/1,115ft.) Apart from offering welcome refreshment this tea house is one of the principle viewpoints of Taktsang, and those who prefer not to climb any further can relax here whilst others continue on. If there is a particular religious gathering or VIP visit in progress, you will not be able to enter the monastery but the further half an hour's ascent is well worth it, as it brings you to another viewpoint directly across from Taktsang. If you are able to make a visit, the final section of the walk takes you from here steeply down 100m/330ft into the gorge that separates you from the monastery and then climbs back up again to reach the monastery gate. Later, you can explore the Paro valley further. You may drive to the end of the valley to visit the ruined monastery/fortress of Drugyel Dzong. This burnt down at the beginning of the last century when a monk overturned a butter lamp by mistake - however, it may not be coincidence that the destruction of the fortress occurred around the time when the Governor of Paro was opposing the Tongsa Penlop, who eventually became installed as the first hereditary ruler. From here, if the weather is clear you may see Mount Chomolhari to the north. Returning down the valley you may visit the ancient temple of Kyichu Lakhang, one of the oldest temples in the country. Day 16 - Further sightseeing in the Paro Valley. Visit Paro Dzong and museum and drive up to Chele La. Today you will have a full day in the Paro Valley. The Paro Valley has had a great strategic importance in the history of Bhutan and was in the past an important staging post on the trade routes with Tibet. Paro Dzong, situated on a rocky outcrop above the Paro Chu and with views down both sides of the valley was historically one of Bhutan's strongest and most strategic fortresses and before the rebuilding of the Tashidodzong in Thimphu it was also the seat of Bhutan's National Assembly. In the morning you may visit the historic Paro Dzong which sits above the valley. Above the dzong the ancient watchtower houses Bhutan's National Museum and a fantastic collection of Bhutanese national treasures. This watch tower was badly damaged in an earthquake and while repairs are ongoing the collection may be housed in a nearby building. Displays in the various galleries depict a wide range of Bhutan's history and culture and includes an impressive collection of ancient thangkas depicting Bhutan's important saints and teachers, as well as some fearsome festival masks, a collection of religious statues and some early stone carvings as well as some original iron links from the nearby Tamchhog Bridge. Later you may drive up to the Chele La Pass, at 3,990m/13,090ft, a drive of about 1½ hours. In clear weather you will have wonderful views of the snow-capped mountains to the west which mark the border with Tibet. Driving back to Paro you may visit the Cliffside monastery of Dzong Drakha. Day 17 - Fly to Kathmandu. Time at leisure. You will be taken to the airport to check in for your flight. Again you have a sensational take-off and scenic Himalayan flight back to Nepal, where you will be transferred to Hotel Shangri La. Depending on the flight schedule you should then have the afternoon free to relax by the pool or do some shopping or sightseeing. After breakfast you will be taken to the airport for your return flight to the UK. Gross National Happiness. The concept of GNH will be one of our lasting memories of Bhutan, quite apart from the spectacular scenery, clean air, beautifully crafted architecture, wonderful people and chilli cheese! The effort, as part of the GNH concept, to retain the cultural heritage of Bhutan, whilst taking modern approaches to equality, education, health care and the environment makes visiting Bhutan such a joy. Seeing the old and young celebrating local festivals in their very finest national costumes, with only a very small minority wearing western clothing, was colourfu beyond measure. GNH gives hope that Bhutan will not rush headlong into becoming just another westernised (if remote) beauty spot.